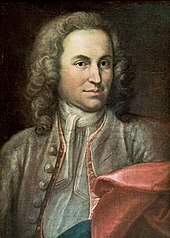 Johann Sebastian Bach was born in Eisenach, Saxe-Eisenach, on 31 March (O.S. 21 March) 1685. He was the youngest child of Johann Ambrosius Bach, the director of the Stadtpfeifer or town musicians, and Maria Elisabeth Lämmerhirt. His father taught him to play violin and harpsichord. His uncles were all professional musicians, whose posts ranged from church organists and court chamber musicians to composers. One uncle, Johann Christoph Bach (1645–93), was especially famous and introduced him to the art of organ playing. Bach was proud of his family’s musical achievements, and around 1735 he drafted a genealogy, “Origin of the musical Bach family”. Bach’s mother died in 1694, and his father eight months later. The 10-year-old orphan moved in with his oldest brother, Johann Christoph Bach (1671–1721), the organist at the Michaeliskirche in nearby Ohrdruf. There, he copied, studied and performed music, and apparently received valuable teaching from his brother, who instructed him on the clavichord. J.C. Bach exposed him to the works of the great South German composers of the day, such as Johann Pachelbel (under whom Johann Christoph had studied) and Johann Jakob Froberger; possibly to the music of North German composers; to Frenchmen, such as Jean-Baptiste Lully, Louis Marchand, Marin Marais; and to the Italian clavierist Girolamo Frescobaldi. The young Bach probably witnessed and assisted in the maintenance of the organ music. 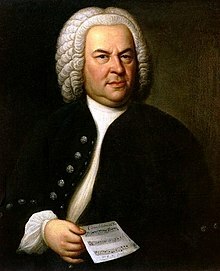 Bach’s obituary indicates that he copied music out of Johann Christoph’s scores, but his brother had apparently forbidden him to do so, possibly because scores were valuable and private commodities at the time. At the age of 14, Bach, along with his older school friend George Erdmann, was awarded a choral scholarship to study at the prestigious St. Michael’s School in Lüneburg, not far from the northern seaport of Hamburg, one of the largest cities in the Holy Roman Empire. This involved a long journey with his friend, probably undertaken partly on foot and partly by coach. His two years there appear to have been critical in exposing him to a wider palette of European culture than he would have experienced in Thuringia. In addition to singing in the a cappella choir, it is likely that he played the School’s three-manual organ and its harpsichords. He probably learned French and Italian, and received a thorough grounding in theology, Latin, history, geography, and physics. He would have come into contact with sons of noblemen from northern Germany sent to the highly selective school to prepare for careers in diplomacy, government, and the military. Although little supporting historical evidence exists at this time, it is almost certain that while in Lüneburg, young Bach would have visited the Johanniskirche (Church of St. John) and heard (and possibly played) the church’s famous organ (built in 1549 by Jasper Johannsen and nicknamed the “Böhm organ” after its most prominent master, Georg Böhm). Given his innate musical talent, Bach would have had significant contact with prominent organists of the day in Lüneburg, most notably Böhm (the organist at Johanniskirche) as well as organists in nearby Hamburg, such as Johann Adam Reincken. 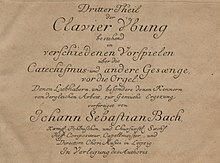 In January 1703, shortly after graduating and failing an audition for an organist’s post at Sangerhausen, Bach took up a post as a court musician in the chapel of Duke Johann Ernst in Weimar, a large town in Thuringia. His role there is unclear, but appears to have included menial, non-musical duties. During his seven-month tenure at Weimar, his reputation as a keyboard player spread. He was invited to inspect and give the inaugural recital on the new organ at St. Boniface’s Church in Arnstadt. The Bach family had close connections with this oldest town in Thuringia, about 40 km to the southwest of Weimar at the edge of the great forest. In August 1703, he accepted the post of organist at that church, with light duties, a relatively generous salary, and a fine new organ tuned to a modern system that allowed a wide range of keys to be used. At this time, Bach was embarking on the serious composition of organ preludes; these works, in the North German tradition of virtuosic, improvisatory preludes, already showed tight motivic control (in which a single, short music idea is explored cogently throughout a movement). In these works the composer had yet to fully develop his powers of large-scale organisation and his contrapuntal technique (in which two or more melodies interact simultaneously). Strong family connections and a musically enthusiastic employer failed to prevent tension between the young organist and the authorities after several years in the post. He was apparently dissatisfied with the standard of singers in the choir; more seriously, there was his unauthorised absence from Arnstadt for several months in 1705–06, when he visited the great master Dieterich Buxtehude and his Abendmusiken at the Marienkirche in the northern city of Lübeck. This well-known incident in Bach’s life involved his walking some 400 kilometres (250 mi) each way to spend time with the man he probably regarded as the father figure of German organists. The trip reinforced Buxtehude’s style as a foundation for Bach’s earlier works, and that he overstayed his planned visit by several months suggests that his time with the old man was of great value to his art. According to legend, both Bach and George Frideric Handel wanted to become amanuensis (assistant and successor) to Buxtehude, but neither wanted to marry his daughter, which was a condition for the position. Johann Christian Schieferdecker eventually accepted the job in 1707. Despite his comfortable position in Arnstadt, by 1706 Bach appeared to have realised that he needed to escape from the family milieu and move on to further his career. He was offered a more lucrative post as organist at St. Blasius’s in Mühlhausen, a large and important city to the north. The following year, he took up this senior post with significantly improved pay and conditions, including a good choir. Four months after arriving at Mühlhausen, he married his second cousin from Arnstadt, Maria Barbara Bach. They had seven children, four of whom survived to adulthood. Two of them—Wilhelm Friedemann Bach and Carl Philipp Emanuel Bach—became important composers in the ornate Rococo style that followed the Baroque. The church and city government at Mühlhausen agreed to his plan for an expensive renovation of the organ at St. Blasius’s. Bach, in turn, wrote an elaborate, festive cantata —Gott ist mein König, BWV 71— for the inauguration of the new council in 1708. The council was so delighted with the piece that they paid handsomely for its publication, and twice in later years had the composer return to conduct it. That same year, Bach was offered a better position in Weimar. After barely a year at Mühlhausen, Bach left, to become the court organist and concertmaster at the ducal court in Weimar, a far cry from his earlier position there as ‘lackey’. The munificent salary on offer at the court and the prospect of working entirely with a large, well-funded contingent of professional musicians may have prompted the move. The family moved into an apartment just five minutes’ walk from the ducal palace. In the following year, their first child was born and they were joined by Maria Barbara’s elder, unmarried sister, who remained with them to assist in the running of the household until her death in 1729. It was in Weimar that the two musically significant sons were born—Wilhelm Friedemann and Carl Philipp Emanuel Bach. Bach’s position in Weimar marked the start of a sustained period of composing keyboard and orchestral works, in which he had attained the technical proficiency and confidence to extend the prevailing large-scale structures and to synthesise influences from abroad. From the music of Italians such as Vivaldi, Corelli and Torelli, he learned how to write dramatic openings and adopted their sunny dispositions, dynamic motor-rhythms and decisive harmonic schemes. Bach inducted himself into these stylistic aspects largely by transcribing for harpsichord and organ the ensemble concertos of Vivaldi; these works are still concert favourites. He may have picked up the idea of transcribing the latest fashionable Italian music from Prince Johann Ernst, one of his employers, who was a musician of professional calibre. In 1713, the Duke returned from a tour of the Low Countries with a large collection of scores, some of them possibly transcriptions of the latest fashionable Italian music by the blind organist Jan Jacob de Graaf. Bach was particularly attracted to the Italian solo-tutti structure, in which one or more solo instruments alternate section-by-section with the full orchestra throughout a movement. In Weimar, he had the opportunity to play and compose for the organ, and to perform a varied repertoire of concert music with the duke’s ensemble. 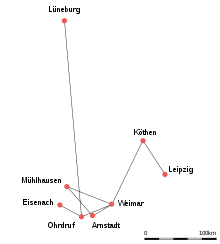 A master of contrapuntal technique, Bach’s steady output of fugues began in Weimar. The largest single body of his fugal writing is Das wohltemperierte Clavier (“The well-tempered keyboard”—Clavier meaning keyboard instrument). It consists of two collections compiled in 1722 and 1744, each containing a prelude and fugue in every major and minor key. This is a monumental work for its masterful use of counterpoint and its exploration, for the first time, of the full range of keys–and the means of expression made possible by their slight differences from each other—available to keyboardists when their instruments are tuned according to systems such as that of Andreas Werckmeister. “ On November 6, , the quondam concertmaster and organist Bach was confined to the County Judge’s place of detention for too stubbornly forcing the issue of his dismissal and finally on December 2 was freed from arrest with notice of his unfavourable discharge. Bach began once again to search out a more stable job that was conducive to his musical interests. Leopold, Prince of Anhalt-Köthen hired Bach to serve as his Kapellmeister (director of music). Prince Leopold, himself a musician, appreciated Bach’s talents, paid him well, and gave him considerable latitude in composing and performing. The prince was Calvinist and did not use elaborate music in his worship; thus, most of Bach’s work from this period was secular, including the Orchestral suites, the Six Suites for Unaccompanied Cello and the Sonatas and partitas for solo violin. The well-known Brandenburg concertos date from this period. Bach composed secular cantatas for the court such as the Die Zeit, die Tag und Jahre macht, BWV 134a. On 7 July 1720, while Bach was abroad with Prince Leopold, tragedy struck: his wife, Maria Barbara, the mother of his first 7 children, died suddenly. The following year, the widower met Anna Magdalena Wilcke, a young, highly gifted soprano 17 years his junior, who performed at the court in Köthen; they married on 3 December 1721. Together they had 13 more children, six of whom survived into adulthood: Gottfried Heinrich, Johann Christoph Friedrich and Johann Christian, all of whom became significant musicians; Elisabeth Juliane Friederica (1726–81), who married Bach’s pupil Johann Christoph Altnikol; Johanna Carolina (1737–81); and Regina Susanna (1742–1809). In 1723, Bach was appointed Cantor of Thomasschule, adjacent to the Thomaskirche (St. Thomas’s Lutheran Church) in Leipzig, as well as Director of Music in the principal churches in the town. This was a prestigious post in the leading mercantile city in Saxony, a neighbouring electorate to Thuringia. Apart from his brief tenures in Arnstadt and Mühlhausen, this was Bach’s first government position in a career that had mainly involved service to the aristocracy. This final post, which he held for 27 years until his death, brought him into contact with the political machinations of his employer, the Leipzig Council. The Council comprised two factions: the Absolutists, loyal to the Saxon monarch in Dresden, Augustus the Strong; and the City-Estate faction, representing the interests of the mercantile class, the guilds and minor aristocrats. Bach was the nominee of the monarchists, in particular of the Mayor at the time, Gottlieb Lange, a lawyer who had earlier served in the Dresden court. In return for agreeing to Bach’s appointment, the City-Estate faction was granted control of the School, and Bach was required to make a number of compromises with respect to his working conditions. Although it appears that no one on the Council doubted Bach’s musical genius, there was continual tension between the Cantor, who regarded himself as the leader of church music in the city, and the City-Estate faction, which saw him as a schoolmaster and wanted to reduce the emphasis on elaborate music in both the School and the Churches. The Council never honoured Lange’s promise at interview of a handsome salary of 1,000 talers a year, although it did provide Bach and his family with a smaller income and a good apartment at one end of the school building, which was renovated at great expense in 1732. 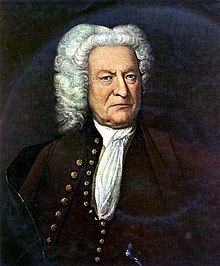 Bach’s job required him to instruct the students of the Thomasschule in singing and to provide weekly music at the two main churches in Leipzig, St. Thomas and St Nicholas. His post obliged him to teach Latin, but he was allowed to employ a deputy to do this instead. In an astonishing burst of creativity, he wrote up to five annual cantata cycles during his first six years in Leipzig (two of which have apparently been lost). Most of these concerted works expound on the Gospel readings for every Sunday and feast day in the Lutheran year; many were written using traditional church hymns, such as Wachet auf, ruft uns die Stimme, Nun komm, der Heiden Heiland, and Wie schön leuchtet der Morgenstern as inspiration for chorale cantatas. To rehearse and perform these works at St. Thomas Church, Bach probably sat at the harpsichord or stood in front of the choir on the lower gallery at the west end, his back to the congregation and the altar at the east end. He would have looked upwards to the organ that rose from a loft about four metres above. To the right of the organ in a side gallery would have been the winds, brass and timpani; to the left were the strings. The Council provided only about eight permanent instrumentalists, a source of continual friction with the Cantor, who had to recruit the rest of the 20 or so players required for medium-to-large scores from the University, the School and the public. The organ or harpsichord was probably played by the composer (when not standing to conduct), the in-house organist, or one of Bach’s elder sons, Wilhelm Friedemann or Carl Philipp Emanuel. Having spent much of the 1720s composing cantatas, Bach had assembled a huge repertoire of church music for Leipzig’s two main churches. He now wished to broaden his composing and performing beyond the liturgy. In March 1729, he took over the directorship of the Collegium Musicum, a secular performance ensemble that had been started in 1701 by his old friend, the composer Georg Philipp Telemann. This was one of the dozens of private societies in the major German-speaking cities that had been established by musically active university students; these societies had come to play an increasingly important role in public musical life and were typically led by the most prominent professionals in a city. In the words of Christoph Wolff, assuming the directorship was a shrewd move that ‘consolidated Bach’s firm grip on Leipzig’s principal musical institutions’. During much of the year, Leipzig’s Collegium Musicum gave twice-weekly, two-hour performances in Zimmerman’s Coffeehouse on Catherine Street, just off the main market square. For this purpose, the proprietor provided a large hall and acquired several musical instruments. Many of Bach’s works during the 1730s and 1740s were probably written for and performed by the Collegium Musicum; among these were almost certainly parts of the Clavier-Übung (Keyboard Practice) and many of the violin and harpsichord concertos. During this period, he composed the Kyrie and Gloria of the Mass in B minor, and in 1733, he presented the manuscript to the King of Poland, Grand Duke of Lithuania and Elector of Saxony, August III in an ultimately successful bid to persuade the monarch to appoint him as Royal Court Composer. He later extended this work into a full Mass, by adding a Credo, Sanctus and Agnus Dei, the music for which was almost wholly taken from some of the best of his cantata movements. Bach’s appointment as court composer appears to have been part of his long-term struggle to achieve greater bargaining power with the Leipzig Council. Although the complete mass was probably never performed during the composer’s lifetime, it is considered to be among the greatest choral works of all time. Between 1737 and 1739, Bach’s former pupil Carl Gotthelf Gerlach took over the directorship of the Collegium Musicum. 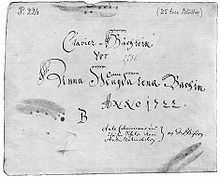 In 1747, Bach went to the court of Frederick II of Prussia in Potsdam, where the king played a theme for Bach and challenged him to improvise a fugue based on his theme. 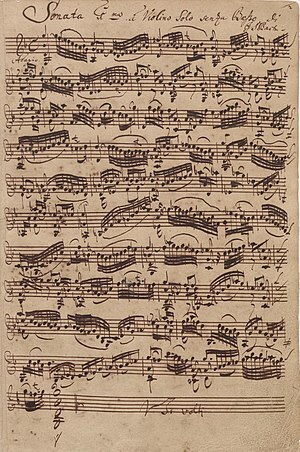 Bach improvised a three-part fugue on Frederick’s pianoforte, then a novelty, and later presented the king with a Musical Offering which consists of fugues, canons and a trio based on the “royal theme,” nominated by the monarch. Its six-part fugue includes a slightly altered subject more suitable for extensive elaboration. The Art of Fugue, published posthumously but probably written years before Bach’s death, is unfinished. It consists of 18 complex fugues and canons based on a simple theme. A magnum opus of thematic transformation and contrapuntal devices, this work is often cited as the summation of polyphonic techniques. The final work Bach completed was a chorale prelude for organ, dictated to his son-in-law, Johann Altnikol, from his deathbed. Entitled Vor deinen Thron tret ich hiermit (Before thy throne I now appear, BWV 668a); when the notes on the three staves of the final cadence are counted and mapped onto the Roman alphabet, the initials “JSB” are found. The chorale is often played after the unfinished 14th fugue to conclude performances of The Art of Fugue. The 1750 “Volbach Portrait” may show Bach in the last months of his life. Bach’s health may have been in decline in 1749; on 2 June, Heinrich von Brühl wrote to one of the Leipzig burgomasters to request that his music director, Gottlob Harrer, fill the post of Thomascantor and Director musices posts “upon the eventual … decease of Mr. Bach.” Bach became increasingly blind, and the celebrated British eye surgeon John Taylor (who would later operate unsuccessfully on Handel) operated on Bach while visiting Leipzig in 1750. Bach died on 28 July 1750 at the age of 65. A contemporary newspaper reported the cause of death as “from the unhappy consequences of the very unsuccessful eye operation”. Some modern historians speculate the cause of death was a stroke complicated by pneumonia. His estate was valued at 1159 thalers and included five Clavecins, two lute-harpsichords, three violins, three violas, two cellos, a viola da gamba, a lute and a spinet, and 52 “sacred books” (many by Martin Luther, Muller and Pfeiffer, including Josephus‘ History of the Jews and nine volumes of Paul Wagner’s Leipzig Song Book). A modern reconstruction of Bach’s head using computer modelling techniques, unveiled 3 March 2008 in Berlin, showed the composer as a strong-jawed man with a slight underbite, his large head topped with short, silver hair. Bach’s musical style arose from his extraordinary fluency in contrapuntal invention and motivic control, his flair for improvisation at the keyboard, his exposure to South German, North German, Italian and French music, and his apparent devotion to the Lutheran liturgy. His access to musicians, scores and instruments as a child and a young man, combined with his emerging talent for writing tightly woven music of powerful sonority, appear to have set him on course to develop an eclectic, energetic musical style in which foreign influences were injected into an intensified version of the pre-existing German musical language. Throughout his teens and 20s, his output showed increasing skill in the large-scale organisation of musical ideas, and the enhancement of the Buxtehudian model of improvisatory preludes and counterpoint of limited complexity. The period 1713–14, when a large repertoire of Italian music became available to the Weimar court orchestra, was a turning point. From this time onwards, he appears to have absorbed into his style the Italians’ dramatic openings, clear melodic contours, the sharp outlines of their bass lines, greater motoric and rhythmic conciseness, more unified motivic treatment, and more clearly articulated schemes for modulation. There are several more specific features of Bach’s style. The notation of Baroque melodic lines tended to assume that composers would write out only the basic framework, and that performers would embellish this framework by inserting ornamental notes and otherwise elaborating on it. Although this practice varied considerably between the schools of European music, Bach was regarded at the time as being on one extreme end of the spectrum, notating most or all of the details of his melodic lines—particularly in his fast movements—thus leaving little for performers to interpolate. This may have assisted his control over the dense contrapuntal textures that he favoured, which allow less leeway for the spontaneous variation of musical lines. Bach’s contrapuntal textures tend to be more cumulative than those of Händel and most other composers of the day, who would typically allow a line to drop out after it had been joined by two or three others. Bach’s harmony is marked by a tendency to employ brief tonicisation—subtle references to another key that lasts for only a few beats at the longest—particularly of the supertonic, to add colour to his textures. Bach’s apparently devout, personal relationship with the Christian God in the Lutheran tradition and the high demand for religious music of his times inevitably placed sacred music at the centre of his repertory; more specifically, the Lutheran chorale hymn tune, the principal musical aspect of the Lutheran service, was the basis of much of his output. He invested the chorale prelude, already a standard set of Lutheran forms, with a more cogent, tightly integrated architecture, in which the intervallic patterns and melodic contours of the tune were typically treated in a dense, contrapuntal lattice against relatively slow-moving, overarching statements of the tune. Bach’s theology informed his compositional structures: Sei Gegrüsset is perhaps the finest example where there is a theme with 11 variations (making 12 movements) that, while still one work, becomes two sets of six—to match Lutheran preaching principles of repetition. At the same time the theological interpretation of ‘master’ and 11 disciples would not be lost on his contemporary audience. Further, the practical relationship of each variation to the next (in preparing registration and the expected textural changes) seems to show an incredible capacity to preach through the music using the musical forms available at the time. Bach’s seal, used throughout his Leipzig years. It contains the letters J S B superimposed over their mirror image topped with a crown. Bach’s deep knowledge of and interest in the liturgy led to his developing intricate relationships between music and linguistic text. This was evident from the smallest to the largest levels of his compositional technique. On the smallest level, many of his sacred works contain short motifs that, by recurrent association, can be regarded as pictorial symbolism and articulations of liturgical concepts. For example, the octave leap, usually in a bass line, represents the relationship between heaven and earth; the slow, repeated notes of the bass line in the opening movement of cantata Gottes Zeit ist die allerbeste Zeit, BWV 106) depict the laboured trudging of Jesus as he was forced to drag the cross from the city to the crucifixion site. On the largest level, the large-scale structure of some of his sacred vocal works is evidence of subtle, elaborate planning: for example, the overall form of the St Matthew Passion illustrates the liturgical and dramatic flow of the Easter story on a number of levels simultaneously; the text, keys and variations of instrumental and vocal forces used in the movements of the Ascension Oratorio Lobet Gott in seinen Reichen, BWV 11) may form a structure that resembles the cross. Beyond these specific musical features arising from Bach’s religious affiliation is the fact that he was able to produce music for an audience that was committed to serious, regular worship, for which a concentrated density and complexity was accepted. His natural inclination may have been to reinvigorate existing forms, rather than to discard them and pursue more dramatic musical innovations. Thus, Bach’s inventive genius was almost entirely directed towards working within the structures he inherited, according to most critics and historians. Bach’s inner personal drive to display his musical achievements was evident in a number of ways. The most obvious was his successful striving to become the leading virtuoso and improviser of the day on the organ. Keyboard music occupied a central position in his output throughout his life, and he pioneered the elevation of the keyboard from continuo to solo instrument in his numerous harpsichord concertos and chamber movements with keyboard obbligato, in which he himself probably played the solo part. Many of his keyboard preludes are vehicles for a free improvisatory virtuosity in the German tradition, although their internal organisation became increasingly more cogent as he matured. Virtuosity is a key element in other forms, such as the fugal movement from Brandenburg Concerto No. 4, in which Bach himself may have been the first to play the rapid solo violin passages. Another example is in the organ fugue from BWV 548, a late work from Leipzig, in which virtuosic passages are mapped onto Italian solo-tutti alternation within the fugal development. Wilhelm Friedemann, “the Halle Bach” (1710–84). Carl Philipp Emanuel, “the Hamburg Bach” (1714–88). There are direct descendants of him living in Germany. J.S. Bach’s works are indexed with BWV numbers, an initialism for Bach Werke Verzeichnis (Bach Works Catalogue). The catalogue, published in 1950, was compiled by Wolfgang Schmieder. The catalogue is organised thematically, rather than chronologically: BWV 1–224 are cantatas; BWV 225–249, the large-scale choral works; BWV 250–524, chorales and sacred songs; BWV 525–748, organ works; BWV 772–994, other keyboard works; BWV 995–1000, lute music; BWV 1001–40, chamber music; BWV 1041–71, orchestral music; and BWV 1072–1126, canons and fugues. In compiling the catalogue, Schmieder largely followed the Bach Gesellschaft Ausgabe, a comprehensive edition of the composer’s works that was produced between 1850 and 1905. For a list of works catalogued by BWV number, see List of compositions by Johann Sebastian Bach. Bach was best known during his lifetime as an organist, organ consultant, and composer of organ works in both the traditional German free genres—such as preludes, fantasias, and toccatas—and stricter forms, such as chorale preludes and fugues. He established a reputation at a young age for his great creativity and ability to integrate foreign styles into his organ works. 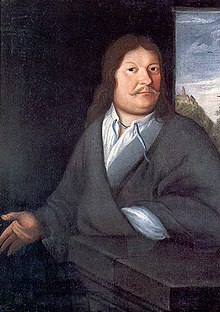 A decidedly North German influence was exerted by Georg Böhm, with whom Bach came into contact in Lüneburg, and Dieterich Buxtehude in Lübeck, whom the young organist visited in 1704 on an extended leave of absence from his job in Arnstadt. Around this time, Bach copied the works of numerous French and Italian composers to gain insights into their compositional languages, and later arranged violin concertos by Vivaldi and others for organ and harpsichord. His most productive period (1708–14) saw the composition of several pairs of preludes and fugues and toccatas and fugues, and of the Orgelbüchlein (“Little organ book”), an unfinished collection of 45 short chorale preludes that demonstrate compositional techniques in the setting of chorale tunes. After he left Weimar, Bach’s output for organ fell off, although his best-known works (the six trio sonatas, the “German Organ Mass” in Clavier-Übung III from 1739, and the “Great Eighteen” chorales, revised late in his life) were all composed after this time. Bach was extensively engaged later in his life in consulting on organ projects, testing newly built organs, and dedicating organs in afternoon recitals. One of the high points may be the third part of the Clavier-Übung, a setting of 21 chorale preludes uniting the traditional Catholic Missa with the Lutheran catechism liturgy, the whole set interpolated between the mighty “St. Anne” Prelude and Fugue on the theme of the Trinity. Bach wrote many works for the harpsichord, some of which may have been played on the clavichord. Many of his keyboard works are anthologies that show an eagerness to encompass whole theoretical systems in an encyclopaedic fashion. The Well-Tempered Clavier, Books 1 and 2 (BWV 846–893). Each book comprises a prelude and fugue in each of the 24 major and minor keys in chromatic order from C major to B minor (thus, the whole collection is often referred to as ‘the 48’). “Well-tempered” in the title refers to the temperament (system of tuning); many temperaments before Bach’s time were not flexible enough to allow compositions to move through more than just a few keys. Among Bach’s lesser known keyboard works are seven toccatas (BWV 910–916), four duets (BWV 802–805), sonatas for keyboard (BWV 963–967), the Six Little Preludes (BWV 933–938), and the Aria variata alla maniera italiana (BWV 989). Bach wrote music for single instruments, duets and small ensembles. Bach’s works for solo instruments—the six sonatas and partitas for violin (BWV 1001–1006), the six cello suites (BWV 1007–1012) and the Partita for solo flute (BWV 1013)—may be listed among the most profound works in the repertoire. Bach composed a suite and several other works for solo lute. He wrote trio sonatas; solo sonatas (accompanied by continuo) for the flute and for the viola da gamba; and a large number of canons and ricercare, mostly for unspecified instrumentation. The most significant examples of the latter are contained in The Art of Fugue and The Musical Offering. Bach’s best-known orchestral works are the Brandenburg concertos, so named because he submitted them in the hope of gaining employment from Margrave Christian Ludwig of Brandenburg-Schwedt in 1721; his application was unsuccessful. These works are examples of the concerto grosso genre. Other surviving works in the concerto form include two violin concertos (BWV 1041 and BWV 1042); a Concerto for Two Violins in D Minor (BWV 1043), often referred to as Bach’s “double” concerto; and concertos for one, two, three and even four harpsichords. It is widely accepted that many of the harpsichord concertos were not original works, but arrangements of his concertos for other instruments now lost. A number of violin, oboe and flute concertos have been reconstructed from these. In addition to concertos, Bach wrote four orchestral suites, a series of stylised dances for orchestra, each preceded by a French overture. The work now known as the Air on the G String is an arrangement for the violin made in the nineteenth century from the second movement of the Orchestral Suite No. 3. An arrangement of the Air for cello and piano was the very first piece of Bach’s music to be recorded, in 1902 in Saint Petersburg, by the Russian cellist Aleksandr Verzhbilovich. Bach performed a cantata on Sunday at the Thomaskirche, on a theme corresponding to the lectionary readings of the week, as determined by the Lutheran Church Year calendar. He did not perform cantatas during the seasons of Lent and Advent. Although he performed cantatas by other composers, he composed at least three entire sets of cantatas, one for each Sunday and holiday of the church year, at Leipzig, in addition to those composed at Mühlhausen and Weimar. In total he wrote more than 300 sacred cantatas, of which approximately 195 survive. His cantatas vary greatly in form and instrumentation. Some of them are only for a solo singer; some are single choruses; some are for grand orchestras; some only a few instruments. A common format consists of a large opening chorus followed by one or more recitative-aria pairs for soloists (or duets) and a concluding chorale. The recitative is part of the corresponding Bible reading for the week and the aria is a contemporary reflection on it. The melody of the concluding chorale often appears as a cantus firmus in the opening movement. Among the best known cantatas are Christ lag in Todesbanden, BWV 4, Ich hatte viel Bekümmernis, BWV 21, Ein feste Burg ist unser Gott, BWV 80, Gottes Zeit ist die allerbeste Zeit, BWV 106 (Actus Tragicus), Wachet auf, ruft uns die Stimme, BWV 140 and Herz und Mund und Tat und Leben, BWV 147. In addition, Bach wrote a number of secular cantatas, usually for civic events such as council inaugurations. These include wedding cantatas, the Wedding Quodlibet, the Peasant Cantata and the Coffee Cantata, which concerns a girl whose father will not let her marry until she gives up her addiction to that extremely popular drink. Bach’s large choral-orchestral works include the grand scale St Matthew Passion and St John Passion, both written for Good Friday vespers services at St. Thomas and St. Nicholas Churches in alternate years, and the Christmas Oratorio (a set of six cantatas for use in the Liturgical season of Christmas). The Magnificat in two versions (one in E-flat major, with four interpolated Christmas-related movements, and the later and better-known version in D major), the Easter Oratorio, and the Ascension Oratorio compare to large, elaborate cantatas, of a lesser extent than the Passions and the Christmas Oratorio. Title page of the Calov Bible, with Bach’s signature in the bottom right hand corner. Bach’s other large work, the Mass in B minor, was assembled by Bach near the end of his life, mostly from pieces composed earlier (such as cantata Gloria in excelsis Deo, BWV 191 and Weinen, Klagen, Sorgen, Zagen, BWV 12). It was never performed in Bach’s lifetime, or even after his death, until the 19th century. Bach’s signature in a copy of a three volume Bible commentary by the orthodox Lutheran theologian, Abraham Calov, was discovered in 1934 in a house in Frankenmuth, Michigan in the US. It is not known how the Bible came to America, but it was purchased in a used book store in Philadelphia in the 1830s or 1840s by an immigrant and taken to Michigan. Its provenance was verified and it was subsequently deposited in the rare book holdings of Concordia Seminary in St. Louis, Missouri. It contains Bach’s markings of texts for his cantatas and notes. It is only rarely displayed to the public. A study of the so-called Bach Bible was prepared by Robin Leaver, titled J.S. Bach and Scripture: Glosses from the Calov Bible Commentary (St. Louis: Concordia Publishing House, 1985). Present-day Bach performers usually pursue either of two traditions: so-called “authentic performance practice”, utilising historical techniques, or alternatively the use of modern instruments and playing techniques, with a tendency towards larger ensembles. In Bach’s time orchestras and choirs were usually smaller than those known to, for example, Brahms, and even Bach’s most ambitious choral works, such as his Mass in B minor and Passions, are composed for relatively modest forces. Some of Bach’s important chamber music does not indicate instrumentation, which gives greater latitude for variety of ensemble. Easy listening realisations of Bach’s music and their use in advertising contributed greatly to Bach’s popularisation in the second half of the twentieth century. Among these were the Swingle Singers‘ versions of Bach pieces that are now well-known (for instance, the Air on the G string, or the Wachet Auf chorale prelude) and Wendy Carlos‘s 1968 groundbreaking recording Switched-On Bach, using the then recently invented Moog electronic synthesiser. Jazz musicians have adopted Bach’s music, with Jacques Loussier, Ian Anderson, Uri Caine and the Modern Jazz Quartet among those creating jazz versions of Bach works. During this time, his most widely known works were those for keyboard. Mozart, Beethoven, and Chopin were among his most prominent admirers. On a visit to the Thomasschule, for example, Mozart heard a performance of one of the motets (BWV 225) and exclaimed “Now, here is something one can learn from!”; on being given the motets’ parts, “Mozart sat down, the parts all around him, held in both hands, on his knees, on the nearest chairs. Forgetting everything else, he did not stand up again until he had looked through all the music of Sebastian Bach”. Beethoven was a devotee, learning the Well-Tempered Clavier as a child and later calling Bach the “Urvater der Harmonie” (“Original father of harmony”) and, in a pun on the literal meaning of Bach’s name, “nicht Bach, sondern Meer” (“not a brook, but a sea”). Before performing a concert, Chopin used to lock himself away and play Bach’s music. Several notable composers, including Mozart, Beethoven, Robert Schumann, and Felix Mendelssohn began writing in a more contrapuntal style after being introduced to Bach’s music. The revival of the composer’s reputation among the wider public was prompted in part by Johann Nikolaus Forkel‘s 1802 biography, which was read by Beethoven. Goethe became acquainted with Bach’s works relatively late in life through a series of performances of keyboard and choral works at Bad Berka in 1814 and 1815; in a letter of 1827 he compared the experience of listening to Bach’s music to “eternal harmony in dialogue with itself”. But it was Felix Mendelssohn who did the most to revive Bach’s reputation with his 1829 Berlin performance of the St Matthew Passion. Hegel, who attended the performance, later called Bach a “grand, truly Protestant, robust and, so to speak, erudite genius which we have only recently learned again to appreciate at its full value”. Mendelssohn’s promotion of Bach, and the growth of the composer’s stature, continued in subsequent years. The Bach Gesellschaft (Bach Society) was founded in 1850 to promote the works; by 1899, the Society had published a comprehensive edition of the composer’s works, with a conservative approach to editorial intervention. Thereafter, Bach’s reputation has remained consistently high. During the 20th century, the process of recognising the musical as well as the pedagogic value of some of the works has continued, perhaps most notably in the promotion of the Cello Suites by Pablo Casals. Another development has been the growth of the “authentic” or period performance movement, which, as far as possible, attempts to present the music as the composer intended it. Examples include the playing of keyboard works on the harpsichord rather than a modern grand piano and the use of small choirs or single voices instead of the larger forces favoured by 19th- and early 20th-century performers. Some composers have paid tribute to Bach by setting his name in musical notes (B-flat, A, C, B-natural; B-natural is notated as “H” in German musical texts, while B-flat is just “B”) or using contrapuntal derivatives. Liszt, for example, wrote a prelude and fugue on this BACH motif in versions for organ and piano). Bach himself set the precedent for this musical acronym, most notably in the final unfinished fugue from Art of Fugue, where it might be interpreted as a signature. While Bach might have conceived this cruciform melody (among other similar ones) as a religious symbol of Christ and the cross, later composers have employed the BACH motif as a secular homage to the composer himself. Examples include Beethoven‘s Diabelli Variations, Shostakovich‘s Preludes and Fugues, Arthur Honegger‘s Prelude, Arioso and Fughetta on the name BACH, and Brahms‘s Cello Sonata in E, whose finale is based on themes from the Art of Fugue in general. Another work explicitly influenced by Bach is Villa-Lobos‘s Bachianas Brasileiras. Bach is commemorated as a musician in the Calendar of Saints of the Lutheran Church on 28 July. He is honored together with George Frideric Handel and Henry Purcell with a feast day on the liturgical calendar of the Episcopal Church (USA) on 28 July. 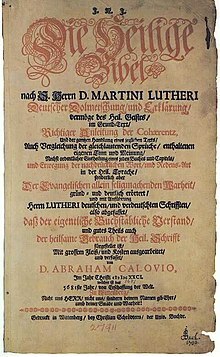 Luther’s Small Catechism, he taught this catechism as the Thomascantor in Leipzig. and some of his pieces represent it. ^ Grout, Donald (1980). A History of Western Music. W. W. Norton & Company. p. 435. ISBN 0-393-95136-7. ^ Jones, Richard (2007). The Creative Development of Johann Sebastian Bach. Oxford University Press. p. 3. ISBN 0-19-816440-8. ^ Malcolm Boyd, Bach (New York: Oxford University Press, 2000), 7–8. ^ Rich, Alan (1995). Johann Sebastiam Bach: Play by Play. Harper Collins. p. 27. ISBN 0-06-263547-6. ^ Karl Geiringer, Johann Sebastian Bach: The Culmination of an Era (New York: Oxford University Press, 1966), 16–17. ^ “Classical Net – Basic Repertoire List – Buxtehude”. Classical.net. http://www.classical.net/music/comp.lst/buxtehude.php. Retrieved 20 September 2008. ^ “The Face Of Bach”. Nathan P. Johansen. http://www.npj.com/thefaceofbach/09w624.html. Retrieved 19 May 2008. ^ Russell H. Miles, Johann Sebastian Bach: An Introduction to His Life and Works (Englewood Cliffs, New Jersey: Prentice-Hall, Inc., 1962), 86–87. ^ Towe, Teri Noel (28 August 2000). “The Inscrutable Volbach Portrait”. The Face of Bach. http://www.npj.com/thefaceofbach/08w828.html. Retrieved 20 May 2008. ^ Breitenfeld, Tomislav; Solter, Vesna Vargek; Breitenfeld, Darko; Zavoreo, Iris; Demarin, Vida (3 Jan. 2006). “Johann Sebastian Bach’s Strokes” (PDF). Acta Clinica Croatica (Sisters of Charity Hospital) 45 (1). http://hrcak.srce.hr/index.php?show=clanak_download&id_clanak_jezik=21520. Retrieved 20 May 2008. ^ Baer, Ka. (1956). “Johann Sebastian Bach (1685–1750) in medical history”. Bulletin of the Medical Library Association (Medical Library Association) 39 (206). ^ Breitenfeld, D.; Thaller V, Breitenfeld T, Golik-Gruber V, Pogorevc T, Zoričić Z, Grubišić F (2000). “The pathography of Bach’s family”. Alcoholism 36: 161–64. ^ “A modern reconstruction of Bach’s head”. http://www.bach-cantatas.com/Memo/Memo-2865.htm. ^ Wolff, Christoph (2000). Johann Sebastian Bach: The Learned Musician. W. W. Norton & Company. p. 166. ISBN 0-393-04825-X. ^ “Im Gespräch: Zum Bachfest in Eisenach kommen wir wieder”. Eisenachonline.de. http://www.eisenachonline.de/nachrichten/archiv/2001.04.02/news/last/2001.04.05-02792. Retrieved 2010-12-31. ^ “Bach, Johann Sebastian”. ClassicalPlus. http://classicalplus.gmn.com/composers/composer.asp?id=2. Retrieved 19 May 2008. ^ “Arnstadt (1703–1707)”. Northern Arizona University. http://jan.ucc.nau.edu/~tas3/arnstadt.html. Retrieved 19 May 2008. ^ “Matthäus-Passion BWV 244”. Bach Cantatas. http://www.bach-cantatas.com/Vocal/BWV244-Spering.htm. Retrieved 19 May 2008. ^ Leaver, R.A.Luther’s Liturgical Music. Grand Rapids, Michigan: Eerdmans Publishing, 2007. Baron, Carol K. (9 June 2006). Bach’s Changing World:: Voices in the Community. University of Rochester. ISBN 1580461905. This entry was posted on 2 March 2011 by nanang basuki santoso. It was filed under Music and was tagged with Johann Sebastian Bach, Musical Offering.